An anniversary is a celebration of love. Sometimes, it takes nothing more than a kiss and a hug to make your love be felt by your special one, but gifts add to the beauty of the occasion. 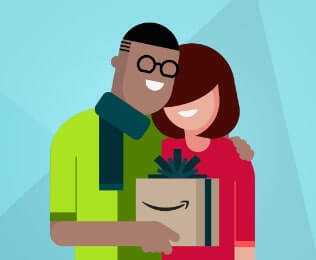 While simply telling the person that you love them and they matter to you is probably the greatest gift in itself, a separate token of love in the form of a purchase would keep the memory inscribed in it. Then the question that immediately arrives in the minds of many is about the anniversary gift ideas for her that would be most suitable. Everyone has their personal choices, we’re sure your better half has them too, and it is best to gift someone they really like. Even then, the problem is that of a little boy in a sweet shop – too many options to choose from. However, you need not go too far from this list as we concisely sum up our list of most widely accepted choices and ideas that you could experiment on this annual celebration of togetherness. Go on make your choices and put all your love into this reading! 2. 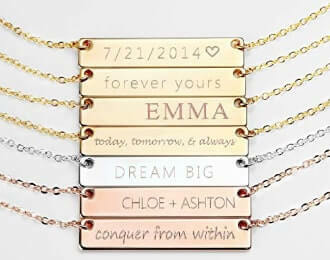 Personalized Jewellery – You Knew This Was Coming! 8. A We’ve Been There Together Map to Tick Off the World! Perfumes are some of the best gifts possible – they can be used for long and if you manage to get hold of the good ones, the scent never seems to fade. The other good thing about them is that they make really wonderful gifts! Consider getting her an exclusive perfume if it permits in your budget – nothing better than smelling good, you see! By the way, not all perfumes are expensive enough to rip you apart. We’ve all heard of personalized mugs, clocks, cards, shirts and other daily merchandise. Have you heard about personalized jewellery? The difference between this and normal jewellery is that personalized pieces of jewellery can add a more unique touch to the anniversary experience. The letter of a name, the name itself or a wonderful picture or representation looks great when set on a bed of precious gems. Of course, the personalized content will always be more precious. 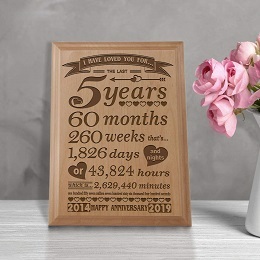 This is a beautifully engraved natural wood plaque for your loved one to be gifted on their 5th Anniversary. It will look great on the wall and express your love. Nowadays, it is getting increasingly difficult to not resort to watching these great shows on Netflix, Amazon Prime or other websites of the sort. The process, which you probably know about is easy. All you need to do is get a membership for a minimal amount of money and that will keep you there for the month, watching exclusive shows and movies that you will love. If you gift her this, you guys can spend a lot of time together watching these wonderful televised motion pictures. Timeless love is best when honoured with the gift of time! Look for a really great watch – there are so many brands and options that you would need to dedicate long hours for your search. Basically, you need to come up with something great that she would love – like, what about a personalized dial? Maybe you would want to consider giving her a fashionable smartwatch – they’re setting the trend nowadays. If you choose to, buy the ones that have nice gems or stones placed on them – sure to grab her attention. There is probably nothing better than gifts that were made personally. Try the basic options if your budget limits you, such as the usual tee or mug or clock or those wall and table calendars you saw the other day. Then, however, there is ample scope to go beyond and do the extraordinary. For example, you could try gifting a personal album of memories, collected all throughout your time with her, or a nice framed photo to adorn her room. 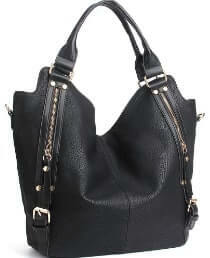 Tote bags can be one of the best anniversary gift ideas for her. They are the perfect things to carry around in everyday urban life, they can fit in all the things she needs, from her purse to that mandatory sunscreen. The other good thing is that these bags are durable and will live long, therefore, eliminating the need to buy the same item again and again. So, if you’re looking for a gift that lasts long enough, you know this is the option for you. Have you people travelled together? There is a map that you can use to record your memories. The “We’ve Been There” map is a relatively new concept, but absolutely crazy. Here, the countries on a world map are covered in scratch off material and you can strike off the countries you visit. This would be a cool gift – it will also motivate you guys to travel the world together. Makeup kits are probably one of the best gifts that you could give her. Look for a good makeup box, which is unique, elegant and popular. Trust us when we say this, if your better half loves her makeup, she will remember this gift for the rest of her life. It doesn’t really cost much to get a simple kit, but if you want to make it special, be prepared to pass the extra buck across the counter. After all, when it comes to anniversary gifts, we don’t quite agree with the idea of calculating expenditures. Love is priceless! If you plan to give flowers, which is an easy and often sought after option, refrain from giving her the roses which wither off in three days. Instead, the best gifts should never wither off, much like your love. Try to contact your local florist and arrange for a bunch of artificial flowers that live for long and remind her of the special day. Bouquets can be significant in both ways, thus becoming one of the most appropriate anniversary gifts for him too! Here is a great anniversary gifts for boyfriends and girlfriends alike. Go and book yourself a flight and set off! Holidays are the best possible gifts, no matter how short they may be. Take a small break and escape to a destination for a few days. This not only serves as a perfect gift, for it will remain etched in her memory, it is also a wonderful way to de-stress and spend time together. The gift of time, you will agree, is above all gifts you could possibly give. Women are known to appreciate the fine qualities of this precious substance. Diamonds are super expensive, so you can proceed to the next point if you do not approve of the cost involved. If you do however, diamonds are available in different forms and are easily introduced in several pieces of jewellery where they look stunning. Being the most beautiful carriers of your message of love, you both will surely bond very well over a set of fine diamonds. Nothing better on a list of wedding anniversary gift ideas, a candlelight dinner can create wonders. You could have your date on a cruise ship, or at a fancy downtown restaurant, which contributes to the perfect dining experience. Try something different, because to go to a regular food joint and gorge on delights is something you could do every day. Now we’ve given you a pretty long list of ideas and will spare you just one more, but did you consider thinking it out yourself? When was the last time she said she wanted something and wanted it really bad? The best anniversary gifts for boyfriends to give would be the wishes of their partners in love. Did you hear her speak to a close friend about something she’d love to have? Brainstorm and discover something that she really won’t be able to refuse. Look at things she likes. Maybe you’ll just come up with something so good that it will be a lifetime asset. To finish off in style, there is nothing better than wine to symbolize romantic relationships. Do go and grab a bottle of the finest wine there. Fill it in to a beautiful crystal glass and spend an evening of love and romance with your better half, aided by wine. As you probably understand, nothing good ever came out of a meeting aided by a glass of tomato juice, so wine is a classy alternative. Anniversaries, in our opinion are one of the year’s most important days. People are known to celebrate their years of togetherness and renew commitments, reinforcing love and mutually unique bonds. On this day, you must make it special. Don’t just simply choose from the list above, but take the idea ahead. Apply the logic we’ve given you to come up with something more personal and unique for your relationship. If you’ve been wanting to say something but it’s been held back, say it on the day. Love, as we all agree, is about establishing yourself in the heart of your beloved. Take your special one out on a date, or take them to a nice dinner (a candlelight dinner would suit). In short, spend the day with them and make the experience memorable. After all, here is a time to revisit the moments of the past, to reminisce about all that you both have been through – times tough and smooth. It is a day to relish the very basic fundamental thing that keeps you together – love. Go ahead and celebrate the union of mutual understanding, the strength of your commitment and reassure yourself that it will last for long. It’s not everyday you get to celebrate your anniversary and when the date is right, all you must do is give it and your partner the best and most memorable experience that you can ever imagine of.